The Bear River is one of many tributaries of the Feather River. 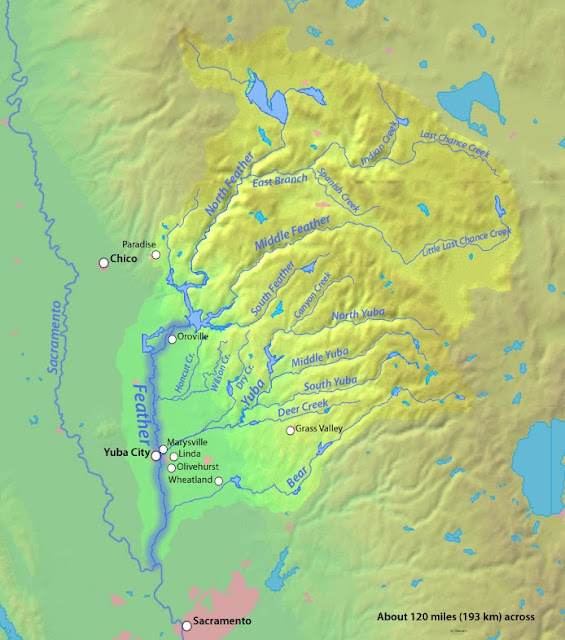 As can be seen on the map below the Bear River has reservoirs at locations where it was dammed as it flows from the Sierra Mountains into the Feather River. The Camp Far West Dam was built in 1963 to hold back the water from the Bear River and Rock Creek. It was named for the last immigration camp on the western trail for 49ers coming into the Sacramento Valley. Wheatland is west of the dam and Beale Air Force Base is north of the dam. The Blackford Road Bridge (16C0081) was built over the spillway for the dam. As homeland security became more of a concern they began prohibiting people from walking across the bridge (see photo below). The National Bridge Inventory states that this bridge was built in 1916 and moved to its present site after the dam was completed (in 1966). It's a Pennsylvania Petit Truss Bridge, which was popular for its ability to span over 300 ft. These bridges typically have sloping portal frames leading to speculation that it may have originally been part of a multispan bridge with trusses sitting end to end on the piers. Yuba County, California Bridges: Blackford Road Bridge across Camp Far West Dam Spillway by Mark Yashinsky is licensed under a Creative Commons Attribution-NonCommercial-NoDerivs 3.0 Unported License.